Last Tuesday representatives from six Massachusetts communities came together at the Turnaround with Wraparound Showcase to share their experiences improving the services and supports they provide to children and families. 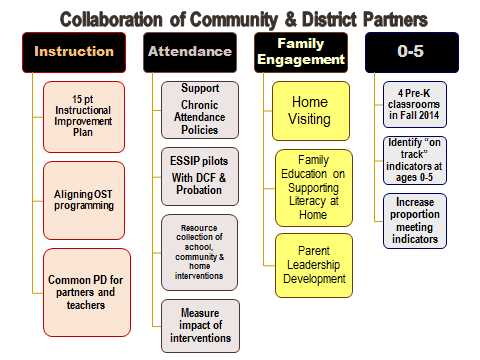 Select schools in Fall River, Holyoke, Lynn, Springfield, Wareham, and Worcester are all part of the Department of Elementary and Secondary Education’s (ESE) Wraparound Zone Initiative, in which improving “wraparound” services is a component of the turnaround strategies of low-performing schools. For the past several years, these communities have been working to address the full spectrum of student non-academic needs by improving school and district systems and collaborating with community providers. Providing comprehensive student supports is one of three overarching strategies that I suggest form the Birth-Third Agenda, and wraparound strategies often include a significant focus on early childhood and early literary. As such, the experiences these communities have had is a rich source of information for Birth-Third efforts. In this post I introduce the Wraparound Zone Initiative drawing on the early childhood and early literacy efforts underway in Worcester and Holyoke. 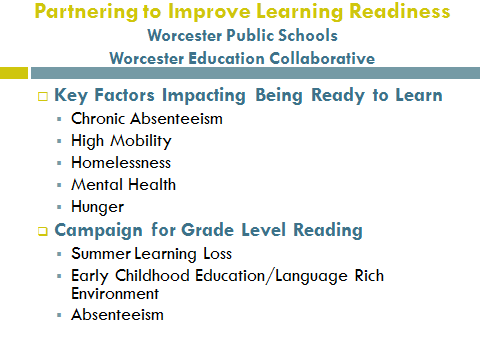 Worcester has selected the issue of chronic absenteeism as the initial focus of much of its wraparound work (along with outreach to families regarding early literacy practices). The Worcester Public Schools has partnered with the Worcester Education Collaborative, a nonprofit organization, on a joint initiative to improve “learning readiness.” Influenced in part by the Campaign for Grade Level Reading, this partnership began investigating school attendance in the Worcester Public Schools. As in many school systems, the overall attendance rate was not a concern, but a closer examination of data revealed a significant chronic absenteeism issue among a subset of students, including a disproportionate number of preschoolers. The partnership undertook a root cause analysis to identify the key factors driving chronic absenteeism among this subset, explains Robert Jennings, Worcester’s Wraparound coordinator, and Jennifer Davis-Carey, who leads the Worcester Education Collaborative. One important finding was that many of the students who are chronically absent live just inside the 2 mile radius around the school. Students outside this radius are eligible for bus transportation. The partnership’s research found that in many cases a parent walks 1.7 to 1.9 miles four times a day (to school and back for drop-off and pick-up) with younger children who weren’t yet of school age in tow. In response the partnership is developing strategies for preschool and kindergarten children in particular. These include using early warning systems and working with neighborhood communities to identify safe routes to school and organize “walking school buses” if possible. Worcester’s Learning Readiness partnership is also investigating the impact on attendance of the district’s suspension policies for younger children. In response to low reading proficiency scores, Holyoke has made early literacy a key community priority and has focused much of its wraparound work on this issue. Holyoke’s approach and the structures it is putting into place will be of interest to other communities working to improve Birth-Third literacy outcomes, but the district is careful to note that they are still in the early stages of this push and do not yet have positive results to show for their work. Holyoke’s wraparound work began at the Peck campus of the Peck-Lawrence Full Service Community School, which was an early leader in the state in providing a full-range of services to address student needs through community partnerships. Three additional campuses in Holyoke have adopted the full-service model. Through its participation in the ESE’s Wraparound Zone Initiative, Holyoke has begun moving towards a district approach to providing full services, with an initial focus on early literacy. The former principal of the Peck campus, Paul Hyry-Dermith, has become the Holyoke’s assistant superintendent. The district administration is currently being restructured, and the plan is to create a district position that oversees full-service work across the public schools. 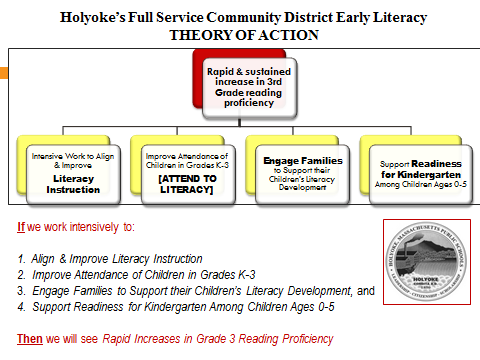 Holyoke’s early literacy initiative comprises four core strategies, and the community has designed a structure in which a workgroup has been formed for each strategy: improving literacy instruction, raising attendance, engaging families, and supporting kindergarten readiness (see theory of action slide above). Establishing four new prekindergarten classrooms in schools that will be run by community-based organizations. Moving forward, as Holyoke reorganizes its district staff and creates a district level role to drive its full service strategies, it plans to complement its early literacy strategies with a second wraparound initiative focused on improving school climate and culture. At a breakout session in which district leaders shared their perspectives on the wraparound work that has taken place in their districts over the past few years, district leaders recognized the challenge of investing time and resources into coordinating full-service activities. These senior leaders emphasized the importance of relentlessly communicating the message that meeting the academic and non-academic needs of students are necessary and complementary pursuits. As the examples from Worcester and Holyoke suggest, the ongoing wraparound work underway in the state is an important resource for informing Birth-Third initiatives, an intersection the Learning Hub will continue to explore.